Planned Parenthood has long (and falsely) claimed that abortions are only three percent of its services. This claim has been debunked multiple times. And yet, in its 2017 report, Planned Parenthood still claims abortions are a mere 3.4 percent of its services — an increase that translates into 11,000 more lives taken in 2017 than in 2016. Abortions rose nearly four percent (3.54%), from 321,384 in 2016 to 332,757 in 2017, the highest number committed by the corporation since 2011. In the past ten years, abortions at Planned Parenthood have risen nine percent (8.98%) from 305,310 in 2007. The abortion corporation provides medication abortion in 357 of its 600 facilities, as well as telemedicine abortion in 13 states. 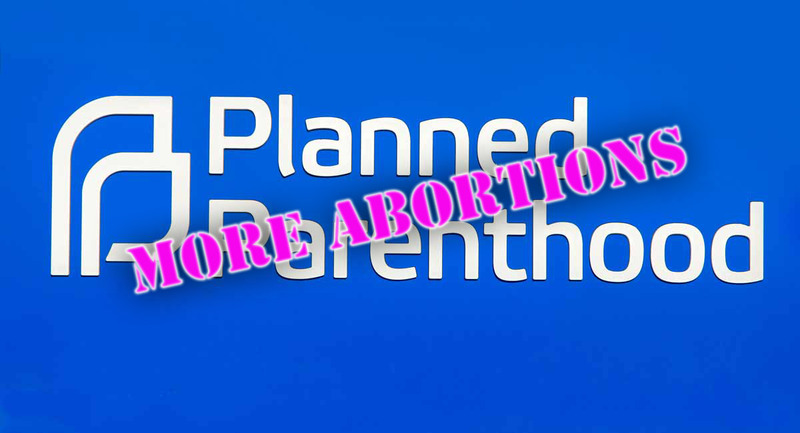 According to a recent survey conducted by Operation Rescue, Planned Parenthood locations now represent a majority (51 percent) of all abortion facilities in the U.S. Out of the 133 abortion clinics which OR discovered would commit abortions at 20 weeks or later, 37 are Planned Parenthood facilities – more than double the number just two years prior. 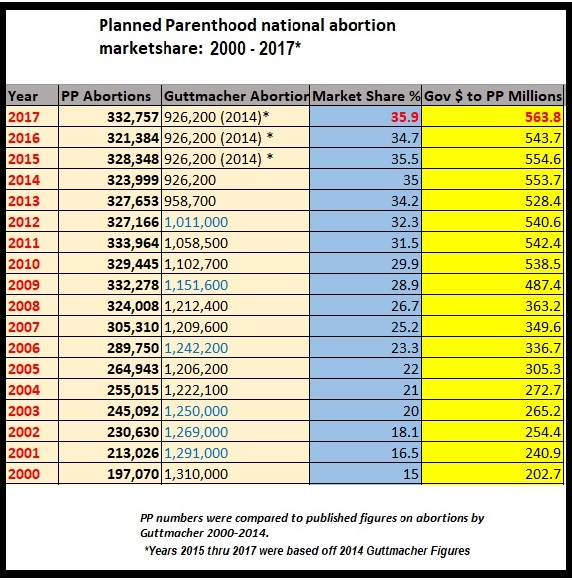 Planned Parenthood’s abortion market share currently stands at 35.9% when compared to the most recent data from the Guttmacher Institute for 2014. This number may increase after Guttmacher releases new figures. This means that one corporation alone commits nearly 36% of all U.S. abortions. In 2017, Planned Parenthood saw an increase in Government funding of nearly four percent (3.69%) from 2016 ($543.7 million to $563.8 million), the highest amount recorded in recent years. In 2017, Planned Parenthood took in $365.7 million in non-government health service revenue and $630.8 million in private donations. As a result, Planned Parenthood was able to pocket a whopping $244.8 million in excess revenue over spending (profit) in 2017, a nearly 149 percent increase from $98.5 million the year prior. 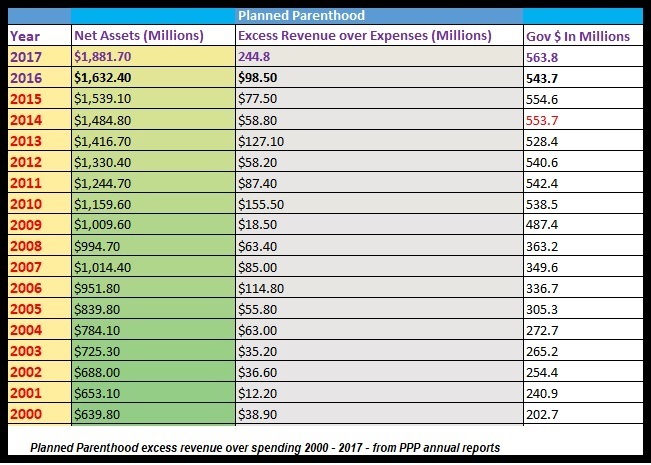 In fact, almost every year since 2000, Planned Parenthood’s revenue has exceeded its expenses by tens of millions of dollars. Even though contraception services make up one quarter of the report’s numbers, overall total contraception services dropped by three percent from last year (2,701,866 in 2016 to 2,620,867 in 2017). Since 2009, contraception services have fallen nearly 35 percent (34.63%) from a high of 4,009,549. In the past 10 years, contraception services have dropped nearly 33 percent (32.63%) from 3,889,980 in 2007 to 2,620,867 in 2017. Pap tests decreased two percent (2.46%) from 281,063 in 2016 to 274,145 in 2017, falling nearly 77 percent (76.84%) from a high of 1,183,692 in 2004. In the past 10 years, Pap tests have decreased nearly 72 percent (71.70%), falling from 968,682 in 2007 to 274,145 in 2017. Breast exams (Planned Parenthood does not perform mammograms) decreased 12 percent (11.97%) from 336,614 in 2016 to 296,310 in 2017, a nearly 73 percent (72.73%) drop from a high of 1,086,654 in 2000. In the past ten years, breast exams have fallen 65 percent (65.19%), from 851,232 in 2007 to 296,310 in 2017. Total cancer screenings dropped seven percent (7.02%) from the previous year (660,777 in 2016 to 614,361 in 2017). This service has fallen nearly 72 percent (71.53%) from a high of 2,157,849 in 2004. In the past 10 years, total cancer screenings fell nearly 68 percent (67.68%) 1,900,850 in 2007 to 614,361 in 2017. HPV treatments rose nearly five percent (4.52%) from 18,853 in 2016 to 19,705 in 2017. Other diagnostic services, which include biopsies, samplings, ablations, and other gynecological surgeries, rose nearly six percent (5.63%) from 5,645 in 2016 to 5,963 in 2017 but dropped seventeen percent from 7,184 in 2015 when the category was added. Planned Parenthood performed 1,074,952 pregnancy tests in 2017, roughly the same amount as 2016 (1,071,642). And, while prenatal care services were up nearly seventeen percent (16.66%) 9,055 in 2017 from 7,762 in 2016 they were down nearly seventy-one percent (70.88%) from their high of 31,098 in 2010. In the past ten years, prenatal care has dropped seventeen percent (17.03%) from 10,914 in 2007 to 9,055 in 2017. Adoption referrals maintained a consistent decline in 2017 , falling twenty-seven percent (27.20%) from 3,889 in 2016 to just 2,831 and forty-two percent (42.37%) from their high of 4,912 ten years prior in 2007. To date, Planned Parenthood performs 117.54 abortions for every adoption they refer out. Planned Parenthood’s recently added categories of miscarriage care and well-woman exams also saw changes. In 2017, miscarriage care rose forty-six percent (46.45%) from 1,182 in 2016 to 1,731 in 2017, while well-woman exams dropped nearly eight percent (7.92%) from 235,355 in 2016 to 216,722 in 2017. Overall, “Other Women’s Health Services” decreased slightly (1%) from 1,315,941 in 2016 to 1,302,460 in 2017. While total services overall increased slightly by two percent (1.57%) from 9,537,592 in 2016 to 9,687,070 in 2017, total services dropped nearly fifteen percent (14.91%) from a high of 11,383,900 in 2009. In the past ten years, total services at Planned Parenthood have fallen eleven percent (11.31%) from 10,921,825 in 2007 to 9,687,070 in 2017. Planned Parenthood’s largest proportion of services (48.7%) consists of STD/STI treatments, which rose six percent (6.29%) from 4,434,039 in 2016 to 4,712,985 in 2017, their highest in years. In 2017, Planned Parenthood’s facility count remained the same at 600, despite once operating 900 facilities. Between 2007 and 2017, the organization shuttered more than 280 facilities. Planned Parenthood’s published client numbers remained unchanged at 2.4 million patients in 2017. However, clients dropped nearly 23 percent from the 3.1 million they boasted in 2006, and 21 percent (20.55%) from the 3,020,651 clients they claimed in 2007. While Planned Parenthood bills itself as a health agency for women, the organization’s male clients are a growing segment. In 2014, Planned Parenthood claims to have served more than 250,000 male patients. That number has now reached twelve percent (288,000), according to spokesperson Alencia Johnson. While Planned Parenthood’s patients are steadily declining, federally funded health centers, as identified by the federal Health Resources and Services Administration, served over 27 million patients in 2017 alone. Planned Parenthood ends the lives of 912 innocent preborn babies each and every day, 38 per hour, and commits one abortion every 95 seconds. Yet, while the corporation’s legitimate health services continue a downward trajectory, Planned Parenthood receives $1,544,657 in tax monies every day. While the abortion vendor has been embroiled in numerous scandals, abuses and fraud, including covering up for child sexual predators as well as disgruntled employees, claiming a toxic work environment and pregnancy discrimination, Planned Parenthood’s 2019 plan has vowed to focus on expanding abortion — and it seems the profitable corporation is doing just that.